We have a new release of dies over at the online store. Our Autumn 2018 dies are here with 10 new designs. They are currently 25% off for a limited time. I am featuring the Pumpkin Pie & Latte + the Fall Phrases dies today. I also have a sample with these new dies here. So let's get started with some detail on my card for this week. Step 1: I started with my layout this week. I am using the Splitcoaststampers sketch #718. It's more of a clean & simple layout but I added a couple of extra layers to change it up a bit. Step 2: Since this is an Autumn card I wanted to use patterned paper that had more of a fall appeal to it. I found this leaf paper and thought it would work well with the pumpkin pie and latte images. White layering panel: 5 3/8" x 4 1/8"
Patterned Paper Panel: 5 1/8" x 3 7/8"
White Image Panel: 2 1/8" x 5 1/8"
Step 3: I cut my pumpkin pie and latte cup using the package colors as my guide. You can color your images but my preference is usually to cut them in colored cardstock. It requires a few more steps but I am always pleased with the outcome. You can check out some of the other DT cards to see the beautiful Copic or Distress ink coloring they do. 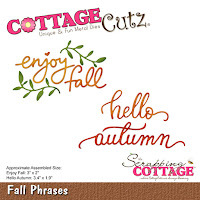 Cut the Fall Phrase in a rich cinnamon (cajun craze) cardstock. Step 4: All my card elements are ready, so it's time to start the card assembly. I attached the card base and layering panels first. Then I moved to the image panel. I wanted to stamp my sentiment before I attached the die cut images. I laid the images on the panel then figured out where to stamp the sentiment. The sentiment had more words than what I wanted to use so I taped off what I didn't want and inked up the word "treat". I used my MISTI just in case I needed to re-stamp the word. I didn't have to because it inked evenly and dark enough on my first attempt. I added my images to the panel using dimensional adhesive. For the fall phrase I used Ranger multi matte medium, it dries clear and has a strong bond. I decided to add a little top border to the image panel- just for added interest. I cut a strip of soft suede cardstock 1/4" x 5 1/8" and attached with double sided tape. To complete the card I used a few soft suede enamel dots. I thought that finished it of nicely. Well that's it for me for this post. I hope I have sparked an idea for using the pumpkin pie & latte cup image. See you next Saturday! nice card! love the pie and coffee! I absolutely love this card! 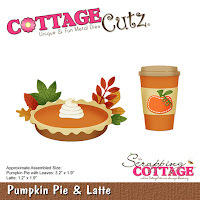 The pie and latte set looks amazing and it looks great with the colored card stock! Very pretty fall card! Love the yummy treats and the great DP you designed the card with so cute! Pumpkin pie -- my favorite! I like how you used only part of that sentiment -- good thinking!